To prevent water from freezing, Anti Freezers are used in an internal combustion engine. Some heat is generated inside the Cylinder while Engine is in working condition. Hence to keep the cylinder in cool condition Air or Water is used as Cooling Media. When the Engine is cooled by circulating water around Cylinder then the Engine is called ‘Water Cooled Engine“. 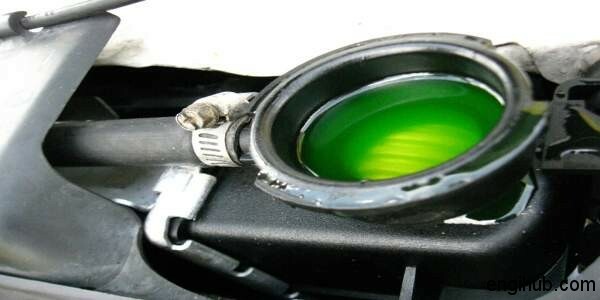 If the Engine is kept idle (without use) for a long time there is a possibility of freezing of water. This mostly happens in winter. The water may freeze and expands leading to fracture in Water Jackets, Water Circulating Pipe or Radiator. To lower the freezing Temperature, a certain mixture is added to water. This mixture is known as “Anti Freezers” in automobile engineering. To avoid the wastage due to Evaporation, its boiling point should be as high as of water. The purpose is to prevent a rigid enclosure from undergoing catastrophic deformation (such as cracking or bursting) due to expansion when water turns to ice. Commercially, either the additive or the mixture may be referred to as anti freezers. No single Anti Freezers satisfy all these requirements. If Alcohol is used, frequent checking with a Hydrometer is required.